Because it is one of the few autoimmune disorders in which the target autoantigen has been definitively identified, myasthenia gravis (MG) provides a unique opportunity for testing basic concepts of immune tolerance. In most MG patients, Abs against the acetylcholine receptors (AChR) at the neuromuscular junction can be readily identified and have been directly shown to cause muscle weakness. T cells have also been implicated and appear to play a role in regulating the pathogenic B cells. A murine MG model, generated by immunizing mice with heterologous AChR from the electric fish Torpedo californica, has been used extensively. In these animals, Abs cross-react with murine AChR; however, the T cells do not. 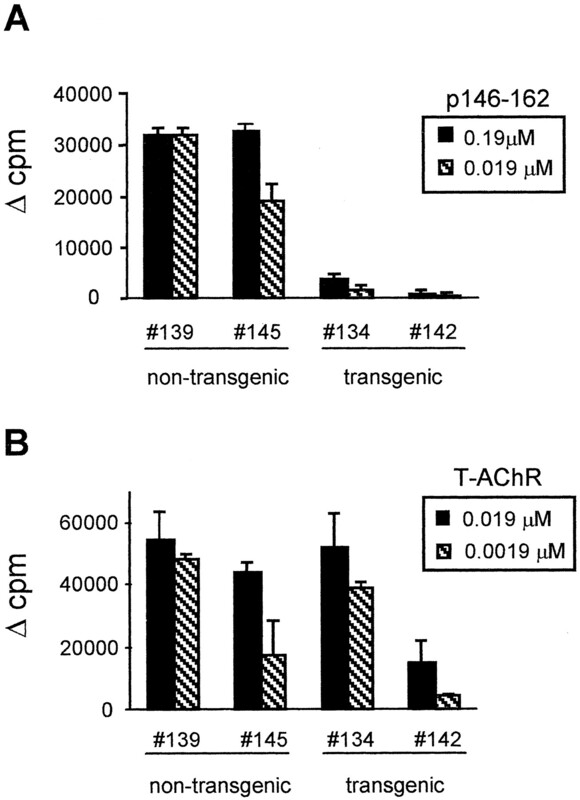 Thus, to study tolerance to AChR, a transgenic mouse model was generated in which the immunodominant Torpedo AChR (T-AChR) α subunit is expressed in appropriate tissues. Upon immunization, these mice showed greatly reduced T cell responses to T-AChR and the immunodominant α-chain peptide. Limiting dilution assays suggest the likely mechanism of tolerance is deletion or anergy. Despite this tolerance, immunization with intact T-AChR induced anti-AChR Abs, including Abs against the α subunit, and the incidence of MG-like symptoms was similar to that of wild-type animals. Furthermore, evidence suggests that this B cell response to the α-chain receives help from T cells directed against the other AChR polypeptides (β, γ, or δ). This model offers a novel opportunity to elucidate mechanisms of tolerance regulation to muscle AChR and to clarify the role of T cells in MG. Numerous transgenic mouse systems have been developed to study immune tolerance to self-Ags. Yet in many of these models, the Ag that is implicated in the human autoimmune disorder has not been used, often because the disease-causing Ag had not been identified (1). Thus, we have chosen to focus on myasthenia gravis (MG),5 one of the few autoimmune disorders in which the self-Ag has been clearly delineated. MG is mediated by Abs against the patient’s acetylcholine receptors (AChR; primarily the α-chain) at the neuromuscular junction (2). T cells have also been implicated in MG. In both humans and in mouse models, there is a MHC-linked genetic susceptibility, suggesting a T cell regulatory function (3, 4). In addition, the occurrence of thymomas and thymic hyperplasias in many patients suggests a T cell association with disease (5). Interestingly, an immunodominant T cell response to certain AChR α-chain epitopes has been observed in MG animal models (6, 7), and T cells from peripheral blood of MG patients react with predominant synthetic peptides of the AChR α-chain (5, 8, 9). However, only a few T cell clones reacting to endogenously processed peptides of the intact AChR α-chain have been isolated from MG patients (10, 11, 12). This raises the possibility that the B cell response in MG may receive help from activation of T cells directed against other AChR chains (13, 14) or even against foreign Ags, i.e., bacterial or viral epitopes (15, 16, 17, 18). Although numerous laboratories have found the C57BL/6 mouse model of MG useful in understanding aspects of the immune myasthenic response, this system cannot be used to address T cell tolerance to endogenous AChR. In this model, mice are immunized with the AChR from Torpedo californica (T-AChR), resulting in the production of anti-T-AChR Abs, some of which cross-react with the mouse AChR causing the muscle weakness associated with disease (experimental autoimmune MG, EAMG) (19). It is clear that CD4+ T cells provide important help to the B cells in this model and, in fact, may regulate the production of pathological Abs (20). Disease susceptibility maps to MHC class II I-A genes with C57BL/6 being the prototypic susceptible strain (I-Ab) (4). In this context, the T cells respond predominantly to the T-AChR α-chain peptide p146–162 (21, 22, 23). This restricted response is reflected in the use of a conserved Vβ6 TCR chain in >50% of the p146–162-responding T cell clones and hybridomas (24, 25, 26). Importantly, T cells responding to p146–162 in this model do not proliferate in response to the homologous murine peptide (7), which lacks a critical TCR peptide contact residue, the lysine at p155. Therefore, the primary T cell response is directed at T-AChR with no recognition of the mouse AChR; it is not a true “autoimmune” response. Only T cells with “self”-reactivity are subject to tolerance; therefore, the mechanisms of tolerance generation, maintenance, and circumvention cannot be addressed. Thus, a new MG model has been developed by deriving a line of transgenic mice in which the T-AChR α-chain is expressed as a “neo” self-Ag. This is analogous to other systems in which immune tolerance has been generated against products of transgenes (27, 28, 29, 30, 31). For example, studies of mice expressing either a viral glycoprotein or β-galactosidase in the thymus both suggest that higher levels of expression will result in more complete central tolerance (29, 30). In another study, mice were generated in which hen egg lysozyme was expressed in different tissues; the degree of peripheral tolerance induced depended on the site of protein expression (31). In general, the degree and mechanism of tolerance varies with level, location, and timing of expression of the transgene, as well as with factors affecting the avidity of the TCR interaction with the peptide-MHC complex (29, 30, 31, 32). Importantly, the T-AChR α-chain transgenic model offers the first opportunity to assess tolerance to the muscle AChR, the immunogenic protein in MG. The transgenic construct is shown diagrammatically in Fig. 1⇓. 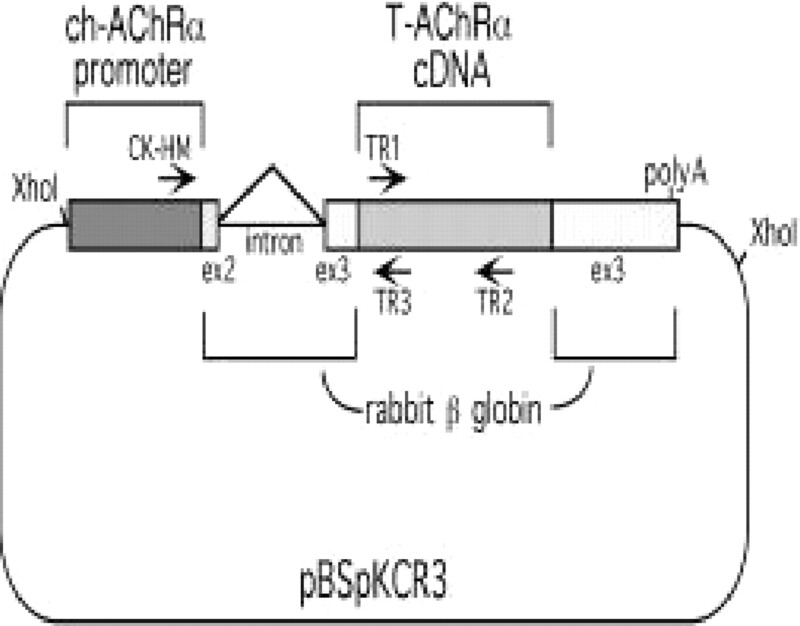 Briefly, it was generated using the vector pBSpKCR3ΔRI, which provides a cleavable intron and a polyadenylation site derived from the rabbit β-hemoglobin gene (33). There are no methionine codons within the globin sequences upstream of the EcoRI cloning site; therefore, translation will initiate at the appropriate ATG within the 1760-bp AChRα cDNA sequence inserted. The cDNA used, from pSS2-T-AChRα, was cloned and kindly provided by Dr. T. Claudio (34). The promoter incorporated was a 850-bp BamHI fragment from upstream of the chicken AChR α-chain gene; it was subcloned from plasmid pSK-Chα, which had been provided by Dr. J. Merlie (35). This promoter had been previously shown to direct transcription of a reporter gene to muscle tissue primarily at the neuromuscular junction (35, 36). The transgenic construct was excised from the plasmid by XhoI digestion and used to produce transgenic mice (37). The presence of the transgene was identified in resulting offspring by Southern blot analysis of tail tissue DNA hybridized with the 32P-labeled XhoI fragment. Transgenic mice of subsequent generations were identified by PCR analysis using the TR1 and TR2 primers (Table I⇓). Map of the T-AChR α-chain transgene. An 850-bp segment of the chicken AChR α gene (ch-AChR α) promoter, including the transcription start site, was inserted 5′ to the T-AChR α cDNA. Polyadenylation and splicing elements were provided by the rabbit β-globin sequences contained within the vector. An XhoI fragment containing the entire transgene was isolated for microinjection. The locations of the PCR primers (see Table I⇓) are indicated as arrowheads. Since the founder transgenic mouse had been derived on a (C57BL/6 × BALB/c)F1 background, the line was backcrossed to C57BL/6, the prototypic MG-susceptible background. The C57BL/6 mice were obtained either from Charles River Breeding Laboratories (Kingston, NY) or from the National Institutes of Aging Colony (Harlan Breeders, Indianapolis, IN). At each generation, the genotype at the I-A locus was assessed using PCR with primer sets that could distinguish between the I-Aαb and the I-Aαd alleles (Table I⇑). In each backcross generation, offspring were selected that were homozygous for I-Aαb and carried the T-AChR transgene. The transgenic mice were housed in a specific pathogen-free animal facility and used in protocols approved by our institution. RNA was isolated from murine tissues by homogenization in guanidinium thiocyanate and centrifugation on a cesium chloride gradient (38). The poly(A)-containing mRNA was enriched by passage over an oligo(dT)-cellulose column (Collaborative Research, Lexington, MA). cDNA was generated from 650 ng of each mRNA by incubation with 1 μg of oligo(dT) primer (Pharmacia, Piscataway, NJ) and 200 U of Moloney murine leukemia virus reverse transcriptase (Life Technologies, Gaithersburg, MD) under standard conditions (39) in a 100-μl reaction. The cDNA was extracted with phenol and chloroform, ethanol precipitated, and resuspended in 50 μl of TE (pH 7.5). PCR was performed using 1 μl of each cDNA in a 50-μl reaction; the primer set (CK-HM/TR3) and PCR conditions are summarized in Table I⇑. Where indicated, samples were taken in duplicate from the PCR at three-cycle intervals, electrophoresed on a 2% agarose gel, stained with ethidium bromide, and visualized with an Alpha-Imager (Alpha Innotech, San Leandro, CA). To increase sensitivity, the PCR products were transferred to a Duralon-UV membrane (Stratagene, La Jolla, CA) and the resulting Southern blot was hybridized at 42°C with an internal 32P-labeled oligonucleotide probe (5′-TAGCACCAACCCTACATGCC-3′). After hybridization, the blots were washed in 2× SET buffer (300 mM sodium chloride, 2 mM EDTA, and 60 mM Tris) with 0.01% SDS at 42°C, and the radioactivity was quantitated directly using a PhosphorImager (Molecular Dynamics, Sunnyvale, CA). As a normalization control, cDNA samples were amplified in parallel using primers across an intron within the hypoxanthine phosphoribosyl transferase (HPRT) gene and subsequently hybridized at 42°C with an internal probe (5′-GGATATGCCCTTGACTATAATG-3′). Using values within the linear range of the PCR for each tissue, the 32P cpm of the T-AChR PCR products were normalized to the HPRT signals. 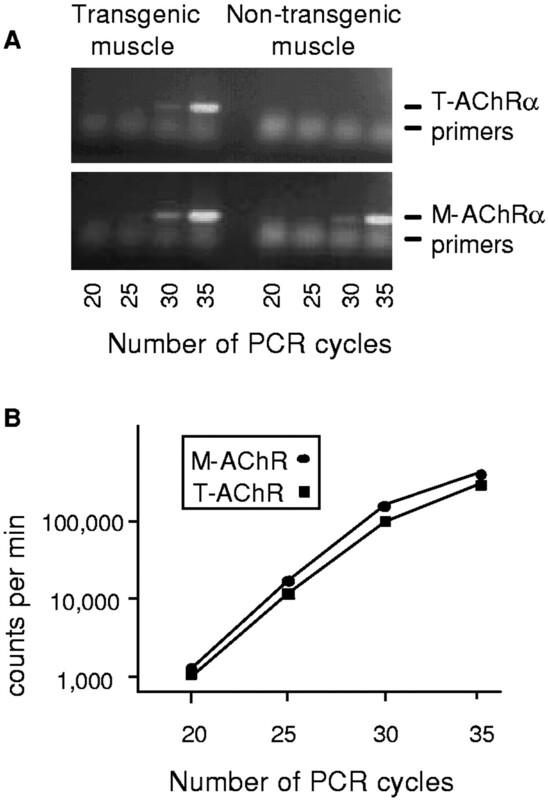 To compare the levels of muscle expression of the T-AChR α-chain with the endogenous mouse AChR α-chain, RT-PCR for increasing numbers of cycles was conducted with primers specific for either the murine AChR α sequence (MR1/MR2) or for the T-AChR α sequence (TR1/TR2) (Table I⇑). PCR products were electrophoresed on a 2% agarose gel and blotted onto a Duralon membrane as previously described. The blot was incubated at 37°C with a probe that hybridizes to both the Torpedo and murine sequences (5′-ATCA(A/G)TGTGGATGAAGTAAATC-3′). The blot was washed at room temperature in 5× SET with 0.01% SDS and the signal was quantified on a PhosphorImager. AChR was obtained from the electric ray, T. californica (Pacific Biomarine, Venice, CA) by affinity chromatography on cobra toxin conjugated to Sepharose 4B (40). To facilitate the study of tolerance to the α-chain alone, a T-AChR α-chain fragment (aa 1–210) was generated from the original cDNA by PCR using the TAChR-RSET primers (Table I⇑). The PCR product was cloned into pRSET A (Invitrogen, Carlsbad, CA) and expressed in Escherichia coli (BL21 pLysS). The recombinant protein had a histidine tag at its amino terminus which facilitated purification over a Ni-NTA column (Qiagen, Valencia, CA). The purified AChR α-chain fragment was then refolded using an oxido-shuffling method, as described by others (41, 42). Briefly, the protein was treated with DTT to reduce disulfide bonds and then incubated in a renaturation buffer containing oxidized and reduced forms of glutathione, l-arginine, EDTA, and Tris-HCl (42). Following dialysis, the protein was concentrated using Amicon Centriplus YM-10 units (Millipore, Bedford, MA). The intact T-AChR, the p146–162 peptide (Protein Chemistry Core Facility, Baylor College of Medicine, Houston, TX), and the recombinant T-AChR α-chain fragment (aa 1–210) were used for injections, as indicated in the text. For T cell experiments, mice were immunized s.c. at the base of the tail with 50 μl of emulsion containing either 25 μg of T-AChR or 1 μg of p146–162 peptide and 25 μl of CFA. For Ab studies, mice were immunized s.c. at five sites (above each shoulder, above each thigh, and at the base of the tail) with a total of 100 μl of emulsion containing 50 μg of T-AChR and 50 μl of CFA or, in one study, with 10 μg of T-AChR α-chain fragment (α1–210) in CFA. For analysis of disease susceptibility, mice were given T-AChR and a simultaneous course of IL-12 (kindly provided by Genetics Institute, Cambridge, MA) (43). The IL-12 was dissolved in PBS with 1% normal mouse sera, and beginning 1 day before T-AChR immunization, 1 μg was given i.p. daily for 5 days. The mice were immunized s.c. at the base of the tail with 25 μg of T-AChR or with PBS in an equal volume of CFA. In a secondary immunization, given 1 mo later, the mice received the same IL-12 regimen with T-AChR/CFA or PBS/CFA. For subsequent immunizations, no IL-12 was given. For both secondary and tertiary exposures, the Ag was given s.c. in multiple sites. T cell proliferation assays were performed as described previously (23). Briefly, 7 days after immunization, inguinal and periaortic lymph nodes were removed and single-cell suspensions were prepared by mechanical disruption in RPMI 1640 supplemented with 10% FBS, 10 mM HEPES, 2 mM l-glutamine, 50 μM 2-ME, 50 U/ml penicillin, and 50 μg/ml streptomycin. The lymph node cells (LNC; 2.5 × 105 cells/0.2 ml/well) were cultured in flat-bottom 96-well plates (Falcon; Corning Glass, Corning, NY) with varying concentrations of T-AChR or peptides of the T-AChR α-chain. The peptides p111–126, p146–162, p182–198, and p360–378 were prepared as described elsewhere (7). The plates were incubated for 96 h, pulsed with 1 μCi of [3H]thymidine/well, and harvested 18 h later. [3H]Thymidine uptake was measured by liquid scintillation spectrometry and the mean cpm of triplicate wells ± SEM was calculated after subtraction of background. The frequencies of T cells specific for p146–162 were assessed by limiting dilution assays as previously described (44). In brief, LNC were plated at concentrations from 0.6 to 10 × 104 cells/well. Spleen cells from C57BL/6 mice were irradiated (3000 rad) and pulsed with 10 μM T-AChR p146–162 for 18 h and were then added (1 × 105 cells/well) as APC. Additional irradiated spleen cells were added to maintain a consistent 2 × 105 cells/well. The T cell response was measured using uptake of [3H]thymidine as described above. Those wells in which the 3H cpm exceeded background by 1 SD were considered positive (45). The fraction of negative wells was plotted against the total number of cells plated per well, and the Poisson statistic was used to derive the precursor frequency. The titers of serum anti-AChR Abs were measured by standard ELISA as previously described (46). Briefly, 96-well ELISA plates (Titertek, Cleveland, OH) were coated with 50 μl/well T-AChR (20 μg/ml in PBS) for 2 h at room temperature. After washing the wells with 0.05% Tween 20 in PBS, the plates were blocked with 200 μl/well 1% BSA in PBS for 1 h at room temperature and kept overnight at 4°C. After washing, 50 μl of each test mouse serum, diluted in 1% BSA/PBS, was added. Five-fold dilutions from 1/25 to 1/78,125 were tested in duplicate. Plates were incubated at room temperature for 2 h, washed, and incubated for 1 h with 50 μl/well rabbit anti-mouse IgG (whole molecule) conjugated to HRP (Sigma-Ald-rich, St. Louis, MO). After washing as above, 100 μl of ABTS with 0.03% hydrogen peroxide was added per well and developed for 10–30 min. Absorbance at 410 nm was read on a Dynatech MRX ELISA platereader (Dynatech Laboratories, Chantilly, VA). Titers were plotted graphically and the average OD ± SEM was plotted for each dilution point. The positive control was a serum with known reactivity to T-AChR, and the negative controls used were 1% BSA in PBS and sera from unimmunized transgenic and nontransgenic mice. Purified T-AChR was reduced and denatured by boiling in SDS loading buffer with 5% 2-ME. The receptor was then applied to a 9% SDS-polyacrylamide gel and electrophoresed at 30–35 mA for several hours to separate the individual polypeptide chains (47). The gel was negatively stained using Copper stain (Bio-Rad, Hercules, CA), and the bands were excised. After destaining with Tris/glycine solution (Bio-Rad), the acrylamide piece was dispersed by forcing it through a 25-gauge needle. Protein was then eluted from the crushed gel by incubating the samples at 37°C for 30 min in Tris-EDTA buffer (pH8) with 1% 2-ME and 0.1% SDS. Eluted protein from each chain was loaded into separate wells and electrophoresed on a 9% SDS-polyacrylamide gel. The fractionated proteins were electroblotted to an Immobilon-P membrane (Millipore), which was then blocked with 5% BSA in TBS, washed, and incubated with primary Ab (1/200 dilution). After washing, the blots were incubated with goat anti-mouse (polyvalent) Ab (1/1000 dilution) conjugated to alkaline phosphatase. Color was developed by addition of nitroblue tetrazolium/5-bromo-4-chloro-3-indolylphosphate substrate (Promega). After immunization with T-AChR/CFA and IL-12, two different assays were used to score development of MG. First, a classical clinical score was assigned as previously described (48). Myasthenic symptoms were graded on the following scale: 0, no disease; 1.0, normal at rest but displays myasthenic symptoms after exercise including chin down, flaccid tail, and forelimb weakness; 2.0, weakness as in stage 1 but shown at rest before exercise; 3.0, severe weakness, dehydration, and paralysis of hind limbs; and 4.0, death. As a secondary measure, a grip strength device with a precision force gauge was used (Columbus Instruments, Columbus, OH). Mice were exercised by 12 gentle pulls across the cage grid (backward walking) and were then allowed to grasp the T-bar of the meter which recorded peak force on a digital display. The maximum force of the three pulls was recorded. This was repeated twice for a total of three peak force values, which were then averaged. To create a suitable model for studies of T cell tolerance to the major autoantigen in MG, AChR, a transgenic mouse was generated in which the T-AChR α-chain should be expressed endogenously as a novel self-protein. To ensure correct physiological expression of the transgene, the promoter for the chicken AChR α-chain gene was used; it had been shown previously to direct transcription of a reporter gene primarily at the neuromuscular junctions in transgenic animals (35). The Torpedo α-chain and the mouse α-chain share about an 80% sequence homology. Moreover, it has been previously shown that the T-AChR α-chain can combine with mammalian β-, γ-, and δ-chains to produce a functional receptor in transfected NIH3T3 cells (49). Therefore, it is likely that the resulting transgenic mouse will express some chimeric receptors comprised of the T-AChR α-chain in association with the murine β, δ, and ε AChR chains. Once a transgenic founder was produced, the T-AChR α transgene was then bred to C57BL/6. Using transgenic and nontransgenic littermates, ∼10 wk of age, RNA was purified from six different tissues and analyzed by RT-PCR using primers designed across the vector-encoded intron (CK-HM/TR3 in Table I⇑). These primers could distinguish between an RT-PCR product derived from RNA (546 bp) and one derived from potentially contaminating DNA (∼900 bp). PCR products were analyzed on Southern blots (Fig. 2⇓A) hybridized with internal 32P-labeled oligonucleotide probes and were normalized to HPRT products amplified in parallel. As shown in Fig. 2⇓B, the T-AChR α-chain transgene is expressed predominantly in muscle tissue, with ∼100-fold lower expression in the brain, and trace levels in thymus. As expected, no transgene-derived RNA was detected in kidney, spleen, or liver (Fig. 2⇓). In addition, when tissues from a 4-wk-old mouse were examined, the same expression profile of the transgene was observed, although thymic expression was slightly higher at this earlier developmental stage. Expression pattern of the transgenic T-AChR α-chain. 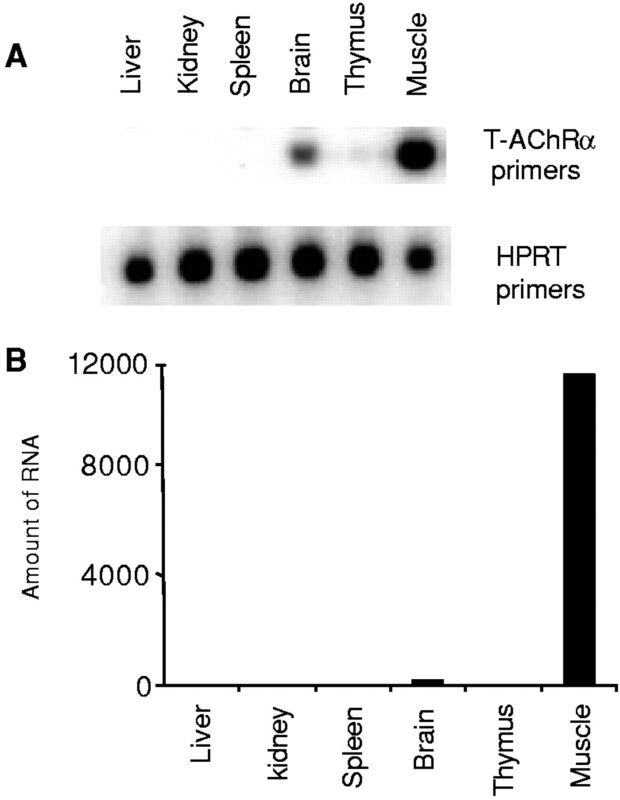 RNA was extracted from mouse tissues and analyzed by RT-PCR using T-AChR primers (CK-HM/TR3) and HPRT primers (HPRT6/HPRT7). Samples were taken from duplicate reactions at three-cycle intervals. The primer sequences and PCR conditions are listed in Table I⇑. The PCR products were electrophoresed on a 2% agarose gel and stained with ethidium bromide. The gel was blotted and hybridized with an internal probe to allow more sensitive quantitation (A). The T-AChR signals are shown graphically following normalization to the HPRT products (B); the normalized phosphorimage values were 11,356 cpm for muscle, 107 for brain, and 6 for thymus. To assess the relative levels of expression of the T-AChR α transgene and the endogenous mouse AChR α gene in muscle, RT-PCR was performed with primers that distinguish the Torpedo and murine α-chain sequences (TR1/TR2 and MR1/MR2 in Table I⇑). The resulting PCR products were analyzed on Southern blots hybridized with an internal oligonucleotide probe common to both the Torpedo and murine gene sequences. As expected, muscle from a nontransgenic littermate showed expression of only the endogenous mouse AChR (Fig. 3⇓A). On the other hand, muscle from transgenic mice contained both murine and Torpedo AChR mRNAs and they were present at approximately equivalent levels (Fig. 3⇓). 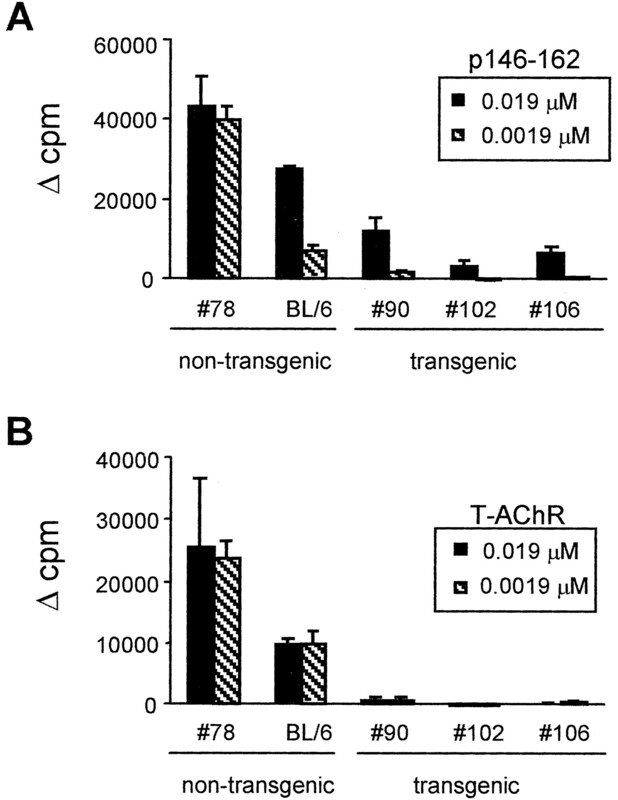 Relative levels of expression of the T-AChR transgene and the endogenous mouse AChR α gene. RNA was extracted from muscles of 8-wk-old nontransgenic and transgenic mice and subjected to RT-PCR for increasing numbers of cycles. Primers were specific for either the murine AChR α sequence (MR1/MR2) or for the T-AChR α sequence (TR1/TR2). For this experiment, primer conditions for TR1/TR2 were identical to those used for MR1/MR2 (Table I⇑). PCR products were electrophoresed on a 2% agarose gel and stained with ethidium bromide (A). In addition, the gel was blotted and hybridized with an internal probe, common to both the Torpedo and murine sequences. The amount of signal was quantified on a PhosphorImager and compared (B). To determine the effect of the expressed T-AChR α-chain on T cell responses, mice were immunized with the immunodominant T-AChR α peptide, p146–162, in CFA at the base of the tail. Seven days later, draining lymph nodes were harvested and tested in vitro for activation. As expected, T cells from nontransgenic mice proliferated vigorously in response to stimulation with either T-AChRα p146–162 (Fig. 4⇓A) or native T-AChR (Fig. 4⇓B). On the other hand, lymph node T cells from the transgenic mice showed markedly reduced proliferation in response to stimulation with p146–162 (Fig. 4⇓A). Moreover, when primed in vivo with p146–162, the in vitro response to the entire multichain T-AChR complex was clearly diminished (Fig. 4⇓B). Thus, expression of the T-AChR α-chain in these transgenic mice appears to induce some level of immune tolerance in the reactive T cells. T cell reactivity to p146–162 in transgenic mice. Three transgenic and two nontransgenic mice were immunized with 1 μg of p146–162 in CFA at the base of the tail. The mice used were all female and included a standard C57BL/6 mouse (BL/6), one nontransgenic mouse (#78) and three transgenic mice (#90, #102, and #106). Seven days after immunization, draining LNC were harvested and tested for proliferation to the indicated concentrations of peptide (A) or AChR (B) by the addition of [3H]thymidine for 18 h. The stimulation is given as Δcpm (mean cpm with Ag stimulation − mean cpm without Ag stimulation). Background counts for #78, BL/6, #90, #102, and #106 were 1186, 650, 1819, 646, and 675 cpm, respectively. The diminished reactivity to p146–162 in lymph node T cells from transgenic mice could be due to either a reduction in the magnitude of the response from individual T cells or to a reduction in the overall number of responding cells. To address this issue, limiting dilution analysis was performed. Transgenic and nontransgenic mice were immunized with T-AChR/CFA; LNC were harvested 7 days later and assayed for reactivity with p146–162-primed Ag APC, as described in Materials and Methods. The LNC from the two nontransgenic mice demonstrated very similar frequencies of p146–162-reactive cells; the number of T cells responding to p146–162 was ∼1 in 12,500 (Fig. 5⇓). On the other hand, in the two transgenic mice, there were many fewer responding T cells; 1 in 78,000 T cells proliferated in vitro to p146–162. 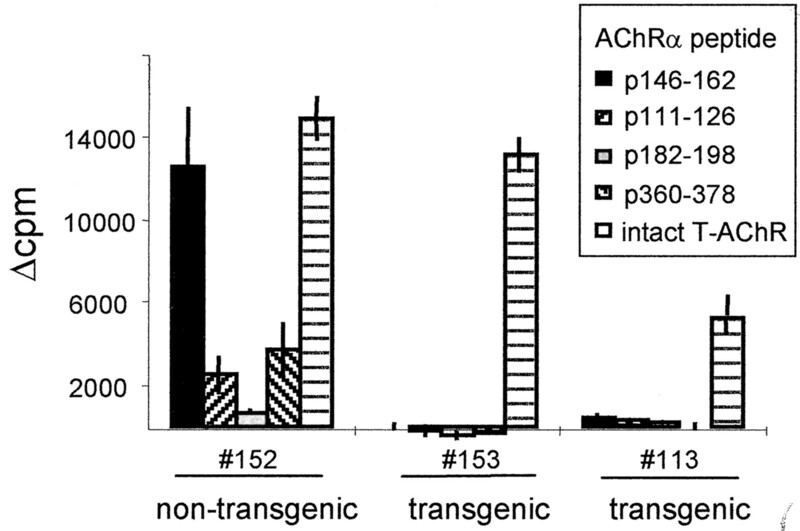 Thus, tolerance to p146–162 of the T-AChR α-chain is apparently due to an overall reduction in the number of responding T cells. The frequency of p146–162-responding T cells in transgenic mice. Frequencies of T cells responding to the p146–162 peptide were determined in limiting dilution cultures in which the number of LNC varied from 0.6 to 10 × 104 cells/well. Response to peptide was measured by a proliferation assay measuring [3H]thymidine incorporation. Positively responding wells were indicated if cpm incorporated exceeded background by 1 SD. The fraction of negative wells was plotted against the total number of LNC plated per well. According to the Poisson statistic, the number of LNC/well that yields a 37% negative culture will contain a single positively responding T cell. The frequency of p146–162-responding T cells from each of the two nontransgenic mice was 1 in 12,500 LNC, whereas the frequency for T cells from each of the two transgenic mice was only ∼1 in 78,000. Given that T cells specific for the immunodominant peptide p146–162 showed evidence of tolerance in the transgenic mouse, it is possible that other AChR-reactive T cells would be selected (50). To address this, mice were immunized with the intact T-AChR in CFA at the base of the tail. Seven days later, draining lymph nodes were harvested and tested for proliferation in response to in vitro stimulation with either p146–162 or T-AChR. Once again, T cells from the transgenic mice were tolerant to the α-chain peptide (Fig. 6⇓A). However, T cell proliferation was seen in response to T-AChR stimulation (Fig. 6⇓B), presumably due to T cells specific for epitopes on the β-, δ-, and γ-chains. These results were further verified in four additional experiments in which responses from a total of 10 transgenic and 7 nontransgenic mice were examined (data not shown); in every case proliferation to p146–162 was markedly reduced in LNC from the transgenic mice yet a response to intact AChR was clearly evidenced. Effect of the transgene on the T cell response to T-AChR. Mice were immunized with 25 μg of T-AChR in CFA at the base of the tail. Seven days later, draining LNC were harvested and tested for proliferation to the indicated concentrations of peptide (A) or AChR (B). [3H]Thymidine incorporation was measured by cpm and the in vitro response to peptide was expressed as the difference in the mean cpm with peptide and mean cpm without peptide. All mice were male; #139 and #145 were nontransgenic, while #134 and #142 carried the transgene. Background counts for #139, #145, #134, and #142 were 2163, 1187, 1534, and 525 cpm, respectively. To determine whether this reactivity pattern would be altered by multiple immunizations, one nontransgenic mouse and two transgenic mice were immunized three times with 50 μg of T-AChR/CFA. Seven days after the final immunization, LNC were harvested and stimulated in vitro with four different peptides of the T-AChR α-chain and with the intact T-AChR molecule. As anticipated, primed cells from the nontransgenic mouse proliferated extensively when given the intact T-AChR or the T-AChR α-chain p146–162 peptide in vitro and, to a lesser extent, when given any of the other three α-chain peptides (p111–126, p182–198, p360–378). On the other hand, although LNC from the transgenic mice responded to the intact T-AChR, they showed little measurable response to p146–162 or to any of the other T-AChR α peptides (Fig. 7⇓). Thus, the T cell tolerance to p146–162 appears to extend to other T cell epitopes on the α-chain and is maintained after multiple exposures to Ag. The effect of multiple immunizations on tolerance to p146–162. Mice were immunized s.c. at five sites (above each shoulder, above each thigh, and at the base of the tail) with a total of 100 μl of emulsion containing 50 μg of T-AChR and 50 μl of CFA. Mice were immunized three times, each 1 mo apart. LNC were extracted 7 days after the third immunization and tested for proliferation to a panel of α-chain peptides (0.14 μM each) as well as the intact T-AChR (0.0019 μM). [3H]Thymidine incorporation was measured by cpm and the in vitro response to peptide was expressed as the difference in the mean cpm with peptide and mean cpm without peptide. Background counts for #152, #153, and #113 were 1995, 1329, and 834 cpm, respectively. Typically, mice immunized with T-AChR produce Abs primarily to epitopes on the α-chain. Thus, in our transgenic model, if the B cell response to the α-chain were tolerized (similarly to the T cell response), one might expect an overall decrease in the anti-T-AChR response. Therefore, mice were immunized with T-AChR and the serum titers of Abs specific to T-AChR were measured after 4 wk by standard ELISA. Somewhat surprisingly, there was no difference in the Ab titer to T-AChR seen between the transgenic sera and the sera from nontransgenic mice. This is illustrated by Ab titers from sera taken 4 wk after primary immunization (Fig. 8⇓A); sera taken at other time points in this study showed similar results. Even the use of IL-12 to augment disease development (as described below) did not differentially affect the Ab production by transgenic and nontransgenic mice. Anti-T-AChR B cell response in T-AChR-immunized transgenic mice. Four transgenic and two nontransgenic mice were immunized with 50 μg of AChR in CFA at five sites (s.c.) and sera were taken 4 wk after immunization. Anti-AChR titer was measured by ELISA (A). There was no difference between the average OD values of transgenic and nontransgenic mice at any dilution point. Similar results were observed in sera drawn at 2 wk after primary or secondary immunization (data not shown). To assess reactivity to individual chains, T-AChR was denatured and the four polypeptides (α, β, γ, and δ) were separately purified, electrophoresed, blotted to Duralon membrane, and reacted with anti-T-AChR sera from transgenic and nontransgenic mice. The binding of mouse Abs was detected using an alkaline phosphatase-conjugated goat anti-mouse Ab. Five transgenic sera were tested and a typical example of α reactivity is shown. Since only the α-chain of the T-AChR was being expressed in the transgenic mice, we reasoned that this B cell response could be directed toward the other three AChR polypeptides. Thus, to test this hypothesis, the individual chains of T-AChR were separated electrophoretically and were then analyzed on Western blots incubated with sera from the immunized mice. As expected, the sera from nontransgenic mice showed reactivity to both the α-chain and to the other polypeptides as well. The transgenic sera showed a similar pattern (Fig. 8⇑B). Even though the T cell response to the α-chain was diminished, every transgenic sera analyzed showed some Ab reactivity to the T-AChR α-chain. Thus, the B cell response in transgenic animals was not tolerized even though the Ag, the T-AChR α-chain, was a self-protein. The transgene appears to elicit split tolerance; T cells specific for epitopes on the T-AChR α-chain are tolerized but B cells are not. Thus, we examined whether T cell tolerance to the immunodominant T-AChR α epitopes would influence disease outcome despite the presence of an anti-T-AChR α-chain B cell response. To induce MG, mice were given multiple immunizations with T-AChR/CFA along with a 5-day course of IL-12, which augments disease development (43, 51). Myasthenic symptoms were monitored in three independent studies by two assays, visual clinical staging and direct measurement of muscle strength using a grip strength meter. A total of 18 nontransgenic mice and 21 transgenic mice were analyzed. MG symptoms of grade 2 or higher, with correlating drops in grip strength, were seen in 12 (66%) of 18 of the nontransgenic mice compared with 9 (43%) of 21 of the transgenic mice (Table II⇑). When results were grouped by gender, 7 of 10 females and 5 of 8 males in the nontransgenic group were severely affected, whereas in the transgenic group, 5 of 11 females and 4 of 10 males were clinical stage 2 or higher. The slight decrease in disease incidence seen in the transgenic mice was not statistically significant. Likewise, little differential was seen in disease severity between the transgenic and nontransgenic mice with MG (Table II⇑). It is possible that the B cell response to the α-chain in T-AChR-immunized transgenic mice (Fig. 8⇑) receives help from T cells directed against the other T-AChR chains (β, γ, or δ). To elucidate the role of T cells in this B cell response, mice were immunized with the recombinant T-AChR α-chain fragment, thus eliminating the possibility of T cell help directed at the other AChR polypeptides. The serum titers of Abs specific to T-AChR were measured after 4 wk by standard ELISA. 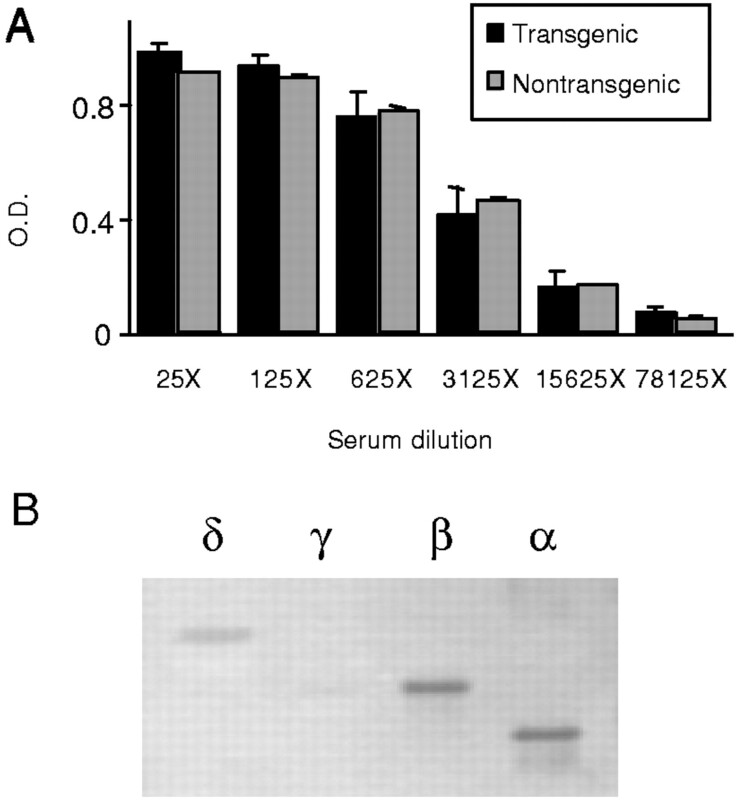 The anti-T-AChR Ab titer of the transgenic mice was clearly reduced over that of the nontransgenics (Fig. 9⇓). Thus, T cell help directed toward other T-AChR chains must have enhanced the anti-α-chain B cell response in the T-AChR-immunized transgenic mice. Anti-T-AChR B cell response in T-AChR α-chain-immunized mice. Six transgenic and five nontransgenic mice were immunized with 10 μg of recombinant T-AChR α-chain fragment (1–210) in CFA at five sites (s.c.) and sera were taken 4 wk after immunization. Anti-AChR titer was measured by ELISA. A log transformation of data was performed followed by ANOVA. 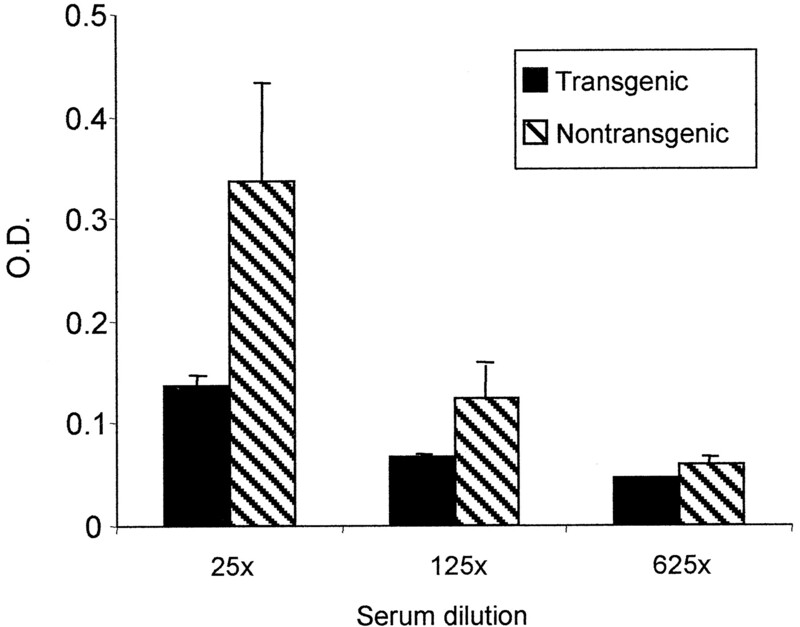 The difference in Ab titer of transgenic and nontransgenic mice was significant at the 25× and the 125× dilution points (p = 0.012 and p = 0.027, respectively). It should be noted that the mice used in this experiment were derived from a cross between our generation six backcross mice and C57BL/6 mice from the NIA contract supplier. Due to contamination of the NIA colony, these animals are not on a pure bred B6 background. However, all do carry a least one I-Ab allele and the T cell responses to α-chain epitopes were shown to be appropriate (data not shown). In the transgenic model presented here, the T-AChR α-chain is expressed in muscle tissues at levels essentially equivalent to those of the endogenous α-chain. This “physiological” pattern of expression allows, for the first time, the examination of the mechanisms of T cell tolerance to the AChR α-chain, the target autoantigen in MG. T cell “ignorance” due to the location of the T-AChR α-chain in an immune privileged site can be ruled out in this model since the mice are first primed with the α-chain Ag in vivo and yet remain tolerant as evidenced by the lack of in vitro proliferation in response to α-chain stimulation. Moreover, the low frequency of anti-T-AChR α-chain-reactive T cells in transgenic mice, as determined by limiting dilution assays, suggests that suppression requiring ongoing exposure to a separate cell subset or to a cytokine milieu is not a likely means of tolerance. On the other hand, these studies do not eliminate a possible contribution by suppressive mechanisms; these may have rendered the cells anergic in vivo. Thus, anti-T-AChR α-chain T cells are most probably inactivated either by anergy or deletion in the transgenic mice. Importantly, trace amounts of the transgene are also found in thymic tissues; this mimics the reported expression of the AChR α-chain in human thymic tissues (52, 53, 54). Thus, the tolerance seen could be mediated either centrally and/or peripherally. A role for central tolerance was suggested by Salmon et al. (30) based on transgenic models using AChR α-chain promoters to drive the β-galactosidase reporter gene; mice with higher levels of thymic expression had more complete T cell tolerance to the reporter gene (30). Yet, in the adult mice with more complete tolerance, a higher β-galactosidase expression was also seen in skeletal muscle; therefore, peripheral mechanisms of tolerance may be equally, or more, important. However, conclusions drawn from the model discussed above should be carefully weighed since the β-galactosidase reporter protein differs in processing and localization from the α-chain of the AChR, and tolerance may have been elicited by distinct mechanisms from those seen in the normal physiological response to AChR. Thus, many questions remain unanswered with regard to immune tolerance to the muscle AChR; the new transgenic model presented should allow us to circumvent many of the limitations inherent in earlier MG models and will allow us to focus on the role of central and peripheral mechanisms in maintaining tolerance to this important autoantigen. Whatever the means of T cell tolerance in this novel model, it is clear that there is a B cell response to the α-chain following T-AChR immunization. This suggests either that the T cell tolerance to the α-chain is “leaky” and/or that the T cell response to the other T-AChR chains (β, γ, δ) may be providing help for the B cell response. Studies in mice and rats support the idea that T cell help may be provided to the anti-AChR B cells even when T cells to immunodominant epitopes are tolerized or blocked (55, 56). Furthermore, adoptive transfer experiments by Yeh and Krolick (57) suggest that, in the rat MG model, T cells directed against each individual AChR chain can provide help for the anti-AChR B cell response. Data presented here (Fig. 9⇑) further define this concept; when T cells directed toward the T-AChRα-chain are “silenced” by expression of the transgene, the B cell response to T-AChR is clearly reduced unless the other T-AChR chains are included in the immunogen (Fig. 8⇑). Whether this type of “indirect” T cell help influences the nature or specificity of the B cell response is not yet clear. Several studies suggest that the nature of T cell help can influence the specificity of the B cell response in the mouse MG model (4, 23, 48). For example, experiments using a murine strain that carries a mutation in the I-Ab (B6.C-H-2bm12) have shown a muted response to p146–162 and a resistance to disease induction (4, 23). Importantly, this bm12 model has a significant Ab response to T-AChR, suggesting a connection between T cell fine specificity and B cell pathogenicity. In this study, we address this issue in a model in which the T-AChR α-chain is now an endogenous Ag and the mice are susceptible to development of myasthenic symptoms. This susceptibility to MG in our model presents an interesting contradiction to the lack of disease seen in the bm12 model. One explanation may be that the MHC alterations in the bm12 model affects not only the presentation of p146–162 of the α-chain, but also certain peptides on other AChR chains which might contribute to disease. However, such hypothetical peptides would have to differ enough from α-chain peptides to avoid being tolerogenic in the transgenic model presented here. An alternative explanation is that tolerization of the α-chain in the transgenic model eliminates the activity of suppressor T cells, which could still be at work in the bm12 model. Interestingly, in the T-AChRα chain transgenic mice, self-directed anti-T-AChR Abs may include not only those against the mouse AChR, but also those that recognize the neo self-T-AChR α-chain determinants. Thus, one might expect disease incidence to be even greater in the transgenic mice than in nontransgenic controls. However, our experiments indicated no increase in MG incidence or severity (Table II⇑) among the transgenic mice; if anything, the induction of myasthenic symptoms occurred with a slightly lower frequency. One explanation is that, as in the bm12 model, when the T cell response to the critical T-AChR α peptide146–162 is diminished, the proportion of the pathogenic subset of Abs also is altered. This is an intriguing hypothesis since disease severity among MG patients does not correlate directly with overall anti-AChR titer (58). Additional explanations are certainly plausible and, in fact, disease incidence in the transgenic mice (and in MG patients) could be influenced by alterations in other T cell effects, such as cytokine-mediated changes in Ag presentation (59, 60, 61, 62). Thus, it is important that the T-AChRα chain transgenic model presented here allows, for the first time, the opportunity to analyze T cell tolerance to an “endogenous” AChR α-chain in induced autoimmune MG. Autoreactive T cell frequencies, as determined by limiting dilution assays, implicate T cell anergy and/or deletion as the more likely means of tolerization. Furthermore, the incidence of MG development in immunized transgenic mice suggests that alterations in the fine specificity of the T cell response may influence the pathogenicity of the B cell response. Finally, although T cells are clearly implicated in human MG, the extent to which T cell help is provided by leaky tolerance to self-AChR and/or by help from T cells directed against other molecules is not yet clear. This mouse model presents a unique opportunity to 1) assess the contribution of AChR α-chain-specific T cells in providing help to B cells; 2) analyze the effects of T cell specificities on the nature of anti-AChR B cell responses; and 3) implicate the specific mechanisms of tolerance that may be compromised in MG patients. We thank Kim Clarkin, Pat Currier, and Kristi Brandon for technical help. We are particularly grateful to Irma Gonzales for isolating the T-AChR from electroplaque tissues and to Peggy Rifleman for protein analyses. In addition, we express our appreciation to the Genetics Institute for providing the IL-12 used in this study. We are also grateful to Dr. Tony Claudio for her generous gift of the T-AChR α cDNA clone, Dr. John Merlie for the plasmid containing the chicken AChR α-chain promoter (originally generated by Dr. J. P. Changeux), Dr. Martha Bond for advice on protein chemistry, and Dr. Mike Lenardo for helpful discussions. ↵1 This work was supported by pilot grants from the University of Texas Health Science Center, San Antonio, Howard Hughes Medical Institute Resources Program for Medical Schools and from the Nathan Shock Aging Center. The Transgenic Core of the San Antonio Cancer Institute was supported by Grant P30CA54174. In addition, S.S. has been funded by the National Institute on Aging Training Program in the Molecular Basis of Aging (5 T32 AG00165), the National Institute on Aging Training Program in Nutritional and Interventional Gerontology (5 T32 AG000205), and the Myasthenia Gravis Foundation of America. ↵2 Current address: Division of Life Sciences, University of Texas, San Antonio, TX 78249. ↵3 Current address: Department of Human Genetics, Virginia Commonwealth University, Richmond, VA 23298. ↵5 Abbreviations used in this paper: MG, myasthenia gravis; AChR, acetylcholine receptor; T-AChR, Torpedo AChR; EAMG, experimental autoimmune MG; HPRT, hypoxanthine phosphoribosyl transferase; LNC, lymph node cell. Brostoff, J., G. K. Scadding, D. Male, and I. M. Roit. 1991. Autoimmune diseases: a general introduction. In Clinical Immunology. Gower Medical Publishing, New York, p. 4.1. Hogan, B., T. Beddington, F. Costantini, E. Lacy. 1994. Production of transgenic mice. Manipulating the Mouse Embryo 217 Cold Spring Harbor Lab. Press, Cold Spring Harbor, NY. Kawasaki, E. S.. 1990. Amplification of RNA. M. A. Innis, Jr, and D. H. Gelfrand, Jr, and J. J. Sninsky, Jr, and T. J. White, Jr, eds. PCR Protocols 21 Academic, San Diego, CA. Lefkovits, I., H. Waldmann. 1999. Limiting Dilution Analysis of Cells in the Immune System, with LDA software developed by P. Rovensky, J. Rubes, and T. Beran 123 Oxford Univ. Press, New York.